Our monthly Spotlight Series cabaret-style shows continue in the month of September with a production called Celebrating Hollywood. Come join us as our fantastic singers explore the incredible music of the movies! A stellar cast of 10 performers will sing the songs that have helped shape the movies that we love. While the precise selections will be a surprise, audiences can expect a thorough exploration through the history of movie music; look forward to the songs you love from the movies that made you love them! 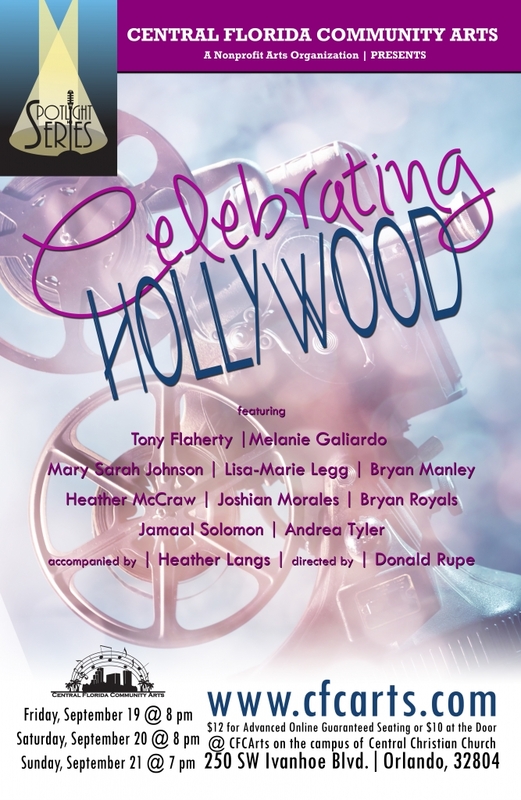 Celebrating Hollywood will take place on Friday, September 19, Saturday, September 20 at 8:00pm and Sunday, September 21 at 7:00pm at Central Christian Church, 250 SW Ivanhoe Blvd., Orlando, 32804. Please park behind the church, going around the left side of the building, and taking care to not use the I-4 entry ramp, which is next to the church’s driveway. Guaranteed seating can be purchased in advance for $12 (credit card/Paypal) or, if available, can be purchased for $10 at the door (cash/check only) – don’t delay; we sold out all 3 shows last month! Doors open 30 minutes before showtime and all seating is general admission.